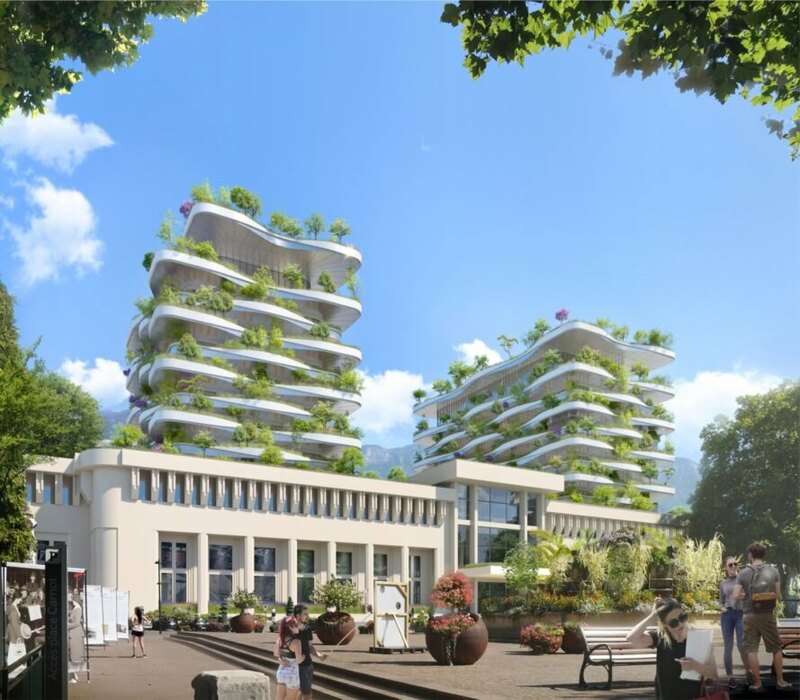 The defunct National Baths of Aix-les-Bains will receive a vibrant and sustainably minded revival in the hands of the Paris-based practice Vincent Callebaut Architectures. Selected as the winner of a competition following the popular vote, the firm’s proposal — dubbed “The Foam of Waves” — will not only restore the ancient thermal baths, but also introduce a sustainable, energy-producing paradigm that follows the carbon-neutral guidelines as recommended by COP 21. The project will adopt a mixed-use program that incorporates residential, commercial, tourist, educational and urban agriculture spaces. The Foam of Waves focuses on the renovation of the Pellegrini, Revel and Princes buildings while staying respectful of the existing Roman remains. To inject new energy into the space, the architects have created a mixed-use program designed to attract locals, tourists and business investment. 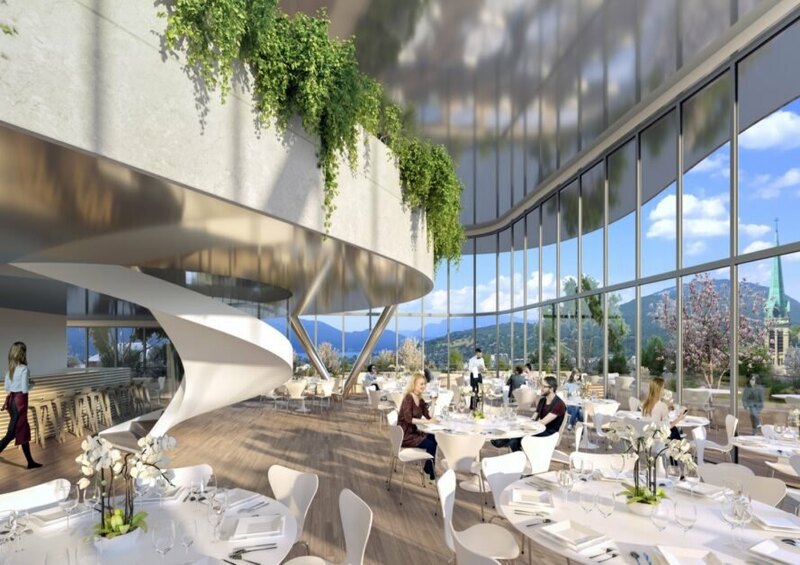 The scope includes a tourist office, a Center of Interpretation of Architecture and Heritage, a wellness center, a teaching space for the Peyrefitte School, a wellness-focused shopping center with restaurants, coworking spaces, 185 “green apartments” and parking. An urban educational farm integrating permaculture and aquaponics will be located on the green roof. 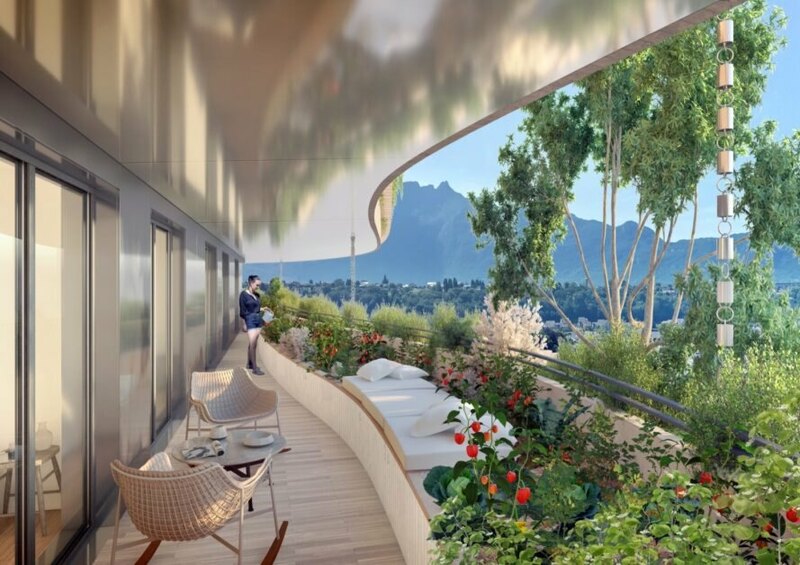 In addition to an expansive green roof, the buildings will feature updated wave-like facades with balconies large enough to accommodate trees and private garden spaces for residents. The building envelopes will be also be optimized for airtightness, insulation and passive solar conditions. The project aims to produce more energy than it consumes and will include a solar photovoltaic and thermal roof, a mini-biomass plant on-site and a co-generation system with rapeseed oil. Rainwater harvesting systems and gray water recycling will also be implemented. 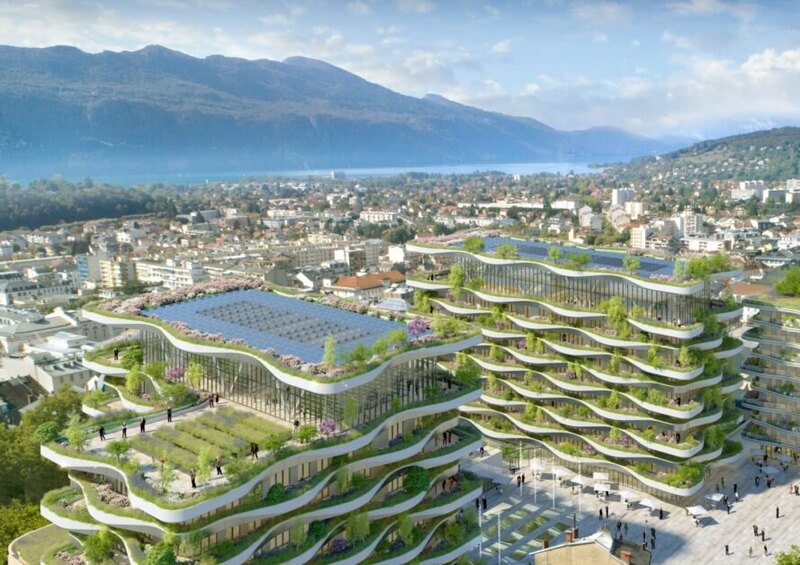 Vincent Callebaut Architectures has won a competition focused on sustainably reviving the National Baths of Aix-les-Bains. The ancient thermal baths are defunct, but the architects have envisioned a sustainable future for the site. The project follows the COP 21 carbon-neutral guidelines. 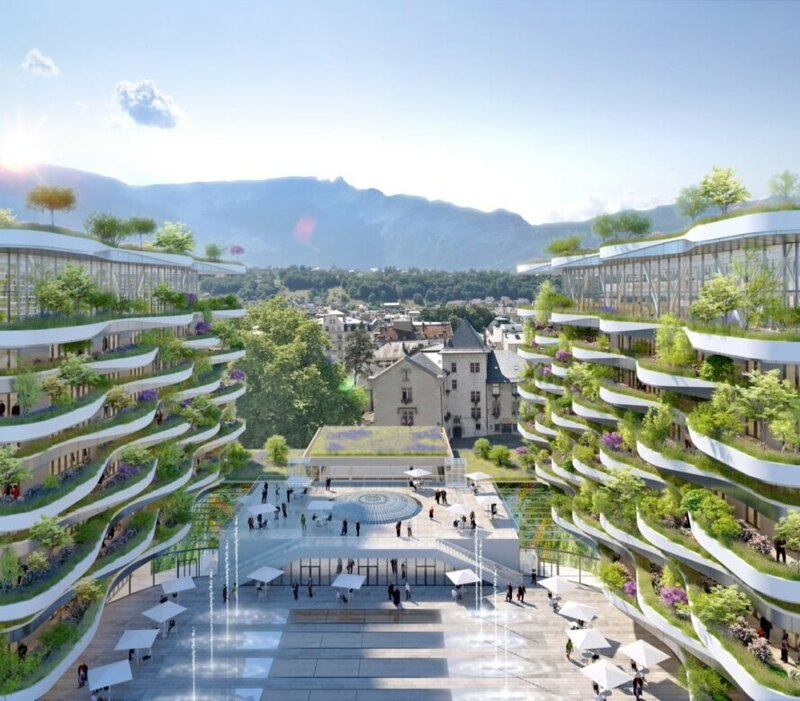 Mixed-use programming will consist of residential, commercial, tourist, educational and urban agriculture spaces. The building will renovate parts of the thermal baths while respecting the existing Roman remains. Urban agricultural space will be located on the green roof. 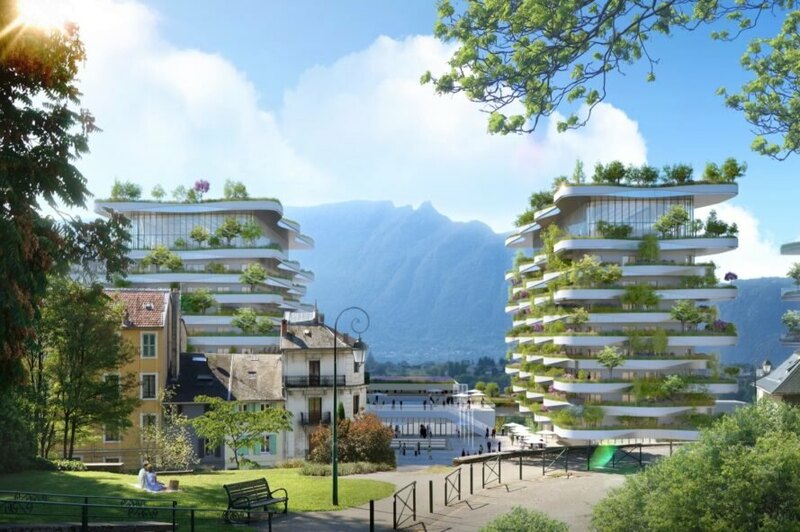 The project will include a tourist office, a Center of Interpretation of Architecture and Heritage, a wellness center, a teaching space for the Peyrefitte School, a wellness-focused shopping center with restaurants, coworking spaces, 185 “green apartments” and parking. The Foam of Waves will include a solar photovoltaic and thermal roof, a mini-biomass plant on-site and a co-generation system with rapeseed oil, among many other green features.